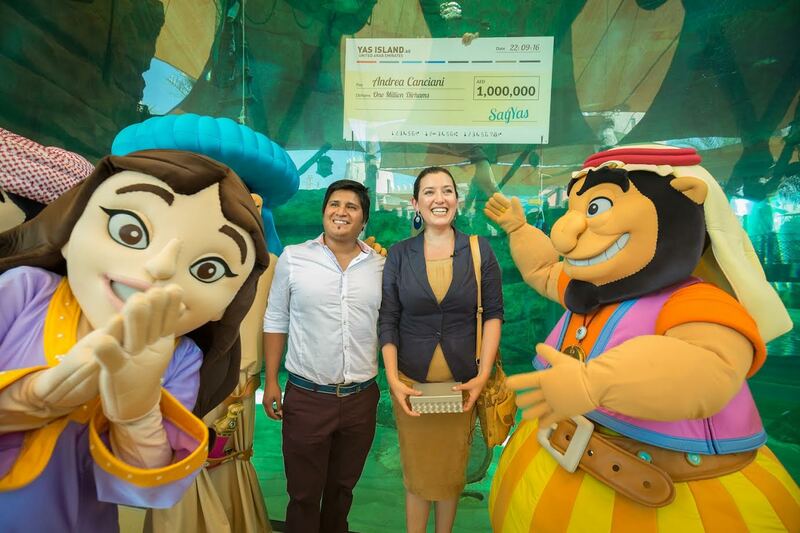 For unsuspecting 32-year-old flight attendant and aspiring musician, Andrea Canciani, the dream just turned into a money-spinning reality as she bagged a bounty of Dh1 million in cash. 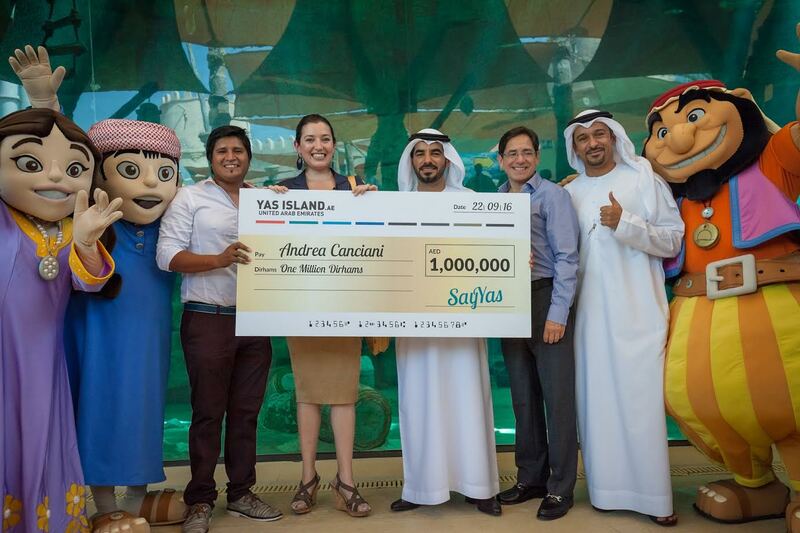 Canciani, who entered the 'Say Yas' prize by spending Dh500 on Yas Island earlier this summer, entered Yas Waterworld on Thursday to collect what she though was a small prize. 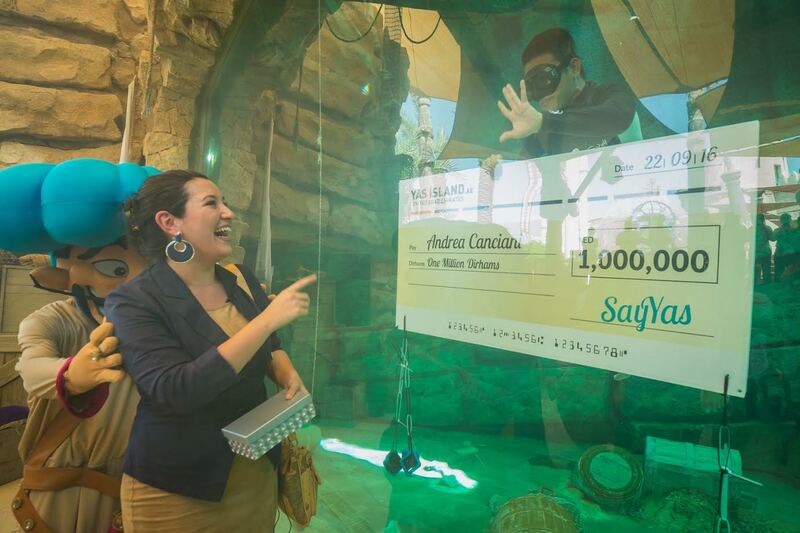 She was escorted to the iconic Hairat Pearl Diving tank by park mascots, where Mohamed Al Zaabi, the CEO of destination Yas Island, congratulated her while two pearl divers unveiled a water-proof cheque worth Dh1m with her name on it. “I can’t believe it, I’m still in shock! My husband and I both thought we had been invited to spend a wonderful day on Yas Island but this news has surpassed all our expectations. I am so grateful and hope this isn’t just a dream," said Canciani. A few hours later, Samer Maslamani, Jordanian UAE-resident, entered Ferrari World Abu Dhabi with his wife, expecting to collect a small prize for having visited Yas Waterworld with his two boys earlier this summer. Upon arrival at the park, the couple were greeted by Jesse Vargas, General Manager of Ferrari World Abu Dhabi, and whisked away on a VIP tour of the park in a Ferrari. After braving an adrenalin-fueled front seat experience on Flying Aces, which boasts the highest rollercoaster loop on the planet, Samer was surprised with an even bigger prize. Al Zaabi presented him with a trip for four people to the Ferrari factory in Maranello, Italy, including Etihad flights and luxury hotel stay. According to Al Zaabi, the 'Say Yas' summer campaign has drawn in more than 50,000 entries with weekly prize draws including three Maseratis, over the three-month long campaign. He stated: “It has been particularly rewarding to be a part of the grand prize giveaways today. Our winners had no idea what they had won until the big reveal – and their reactions were priceless. "It brings all of us at Yas Island great joy to spread happiness." 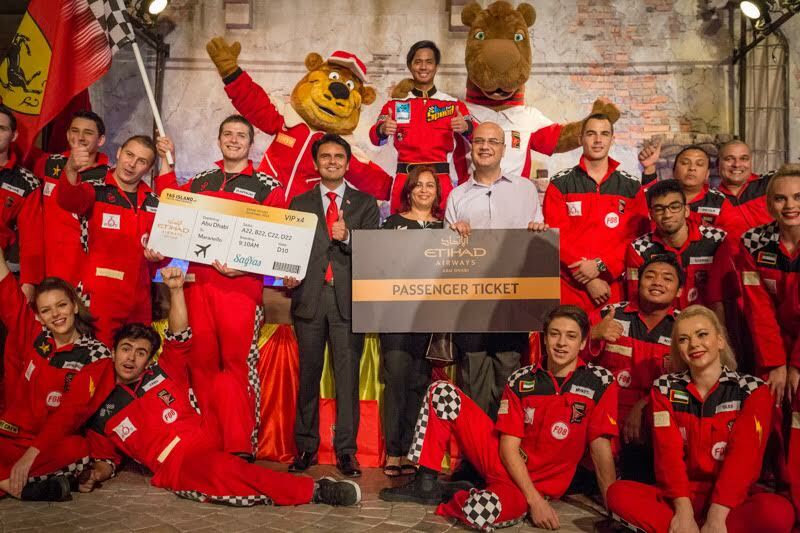 The Say Yas campaign, which ran from July 7 until September 16, included a range of offers, including the Dh1m in cash, a trip for four people to the Ferrari factory in Maranello, Italy, including Etihad flights and luxury hotel stay. Other prizes included three luxury Maseratis, each worth more than Dh400,000, weekly draws for VIP Yas Island staycations; and three weekly gift vouchers worth Dh10,000 each for the 370-store Yas Mall, the largest mall in Abu Dhabi.